A lot of you will know of the beast that lurked in our garden. A few years ago now we were in a shopping centre and saw a tiny wee cactus, it was small and not a spine on it. We thought it safe to bring home. Well we bought home a demonic monster. The minute we planted this in our garden it grew and I am sure faster then Jack's Bean Stalk. 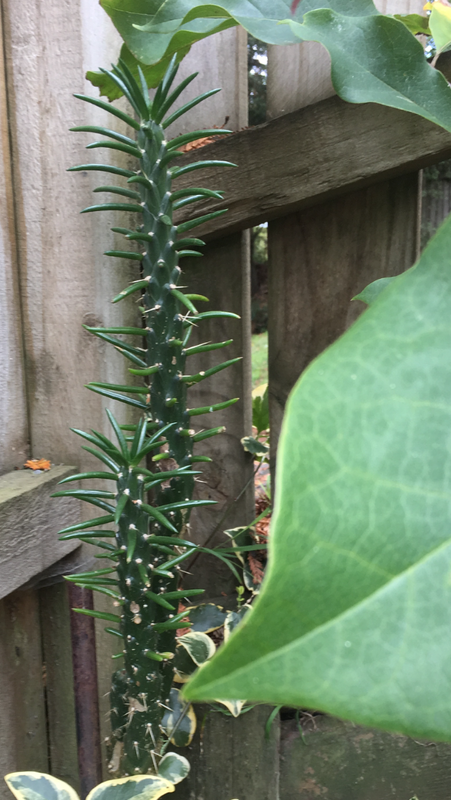 A neighbour ended up with a hospital visit after a brush with our cactus. It got to the stage where, as an art installation we even stabbed it with old forks and left them inserted; chopped off limbs and covered them with little pots. It would not die. George at one time removed all needles, thinking to render it harmless. Did that work? Oh no. The needles returned like something out of a horror movie, except with even stronger and more needles. In the end we had no recourse but to totally chop it down. Do you know even chopped off it still was a lethal weapon. We had large pieces laying on concrete that we gave away on one of those free websites, and after something like 6 months it lay there out of the dirt and still as green and menacing as ever. When pieces were given away, we had to relate its history out of sympathy for receivers. That is all historical and you may well wonder what it has to do with the present? Well in a fit of pity, we decided to keep one tiny piece and plant it well away from the house, down our driveway. For once it did not fare well. It received very little sunshine. I used to say a little triumphant harrumph every time I walked passed.